For many STEM students, working for NASA is a lifelong dream. For Arizona State University's NASA Space Grant Scholars, that dream is already a reality. Since 1988, ASU has participated in the national NASA Space Grant Program, designed to provide STEM undergraduate and graduate students with the opportunity to actively work on NASA-related research alongside a faculty mentor. Up to 50 ASU students are selected each year for this prestigious program. Each scholar conducts a year-long research program and presents the results of their research in NASA-related fields ranging from small satellites to astrobiology. “Being a NASA Space Grant Scholar provides an opportunity for undergraduates to work on real projects and gain real-world experience while they are at ASU,” said Tom Sharp, professor in the School of Earth and Space Exploration and director of ASU’s NASA Space Grant program. Students interested in applying to the ASU NASA Space Grant program for the 2018–19 school year may submit an application on the NASA Space Grant website. The deadline for applications is May 8. The program accepts up to 50 students per year. “Our scholars work with a faculty mentor throughout their internships. This gives them opportunities, references, and a distinct advantage when applying for graduate school or for positions in professional STEM fields,” Sharp said. 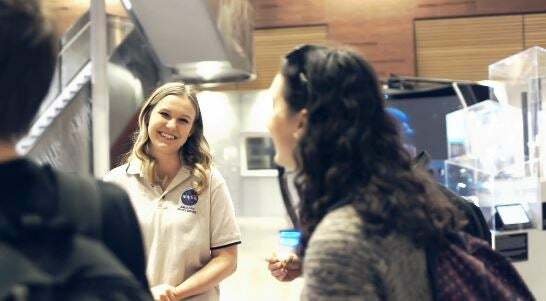 The current ASU NASA Space Grant Scholars will be showcasing their research projects at the annual NASA Space Grant Poster Session from 10 a.m. to 2 p.m. Wednesday, Feb. 14 in the Interdisciplinary Science and Technology Building IV on the ASU Tempe Campus. This free event is open to the public. More than 40 students will be presenting works to the public on research projects involving CubeSats, exoplanets, hybrid rockets and other projects that span engineering and science fields. “For ASU students interested in becoming a NASA Space Grant Scholar, February’s poster session is a great opportunity to meet with current scholars and find out how to apply for the program,” said Desiree Crawl, senior coordinator for the program. The poster session will also prepare the scholars for their next hurdle, presenting their projects at the Arizona NASA Space Grant Undergraduate Research Internship Symposium in Tucson on April 14. They will be joined by students from UofA and NAU, who also participate in the NASA Space Grant Program. Since ASU is already known for its innovation ranking, these students are sure to represent their fields, and the university, with flying colors in this statewide event.